71,5 x 58,7 cm - 28 1/8 x 23 1/16 in. 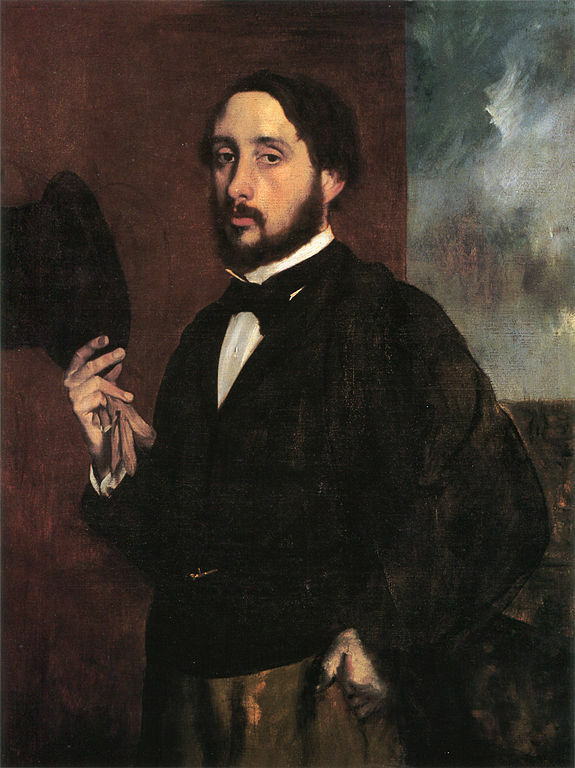 Don de l’artiste à Mary Cassatt [?] 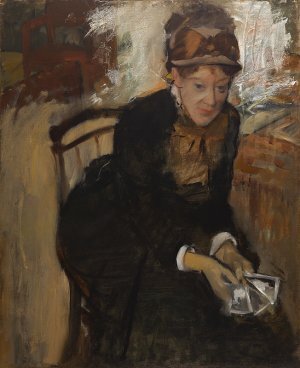 – Cassatt, Paris [? ], 1884-1913 – Ambroise Vollard, avril 1913-1917 – Wilhelm Hansen, Copenhague, 1918-1923 – Kijiro Matsukata, Paris, 1923-1951 [Galerie Barbazanges ?] – Wildenstein & Co., New York, novembre 1951 – M. et Mme André Meyer, 1952-1980 – Vente Meyer, Sotheby’s Parke Bernet, New York, 22 octobre 1980, n° 24 – Galerie Beyeler, Bâle – Washington, The National Portrait Gallery, 1984. Berlin, galerie Cassirer, 1913, n° 5 – Zurich, Kunsthaus, 1917, n° 90 (repr.) – Copenhague, Ny Carlsberg Glyptotek, 1920, n° 7 – Paris, galerie Georges Petit, 1924, n° 58 – New York, Wildenstein & Co., 1960, n° 41 (repr.) – Washington, National Gallery, 1962, p. 20 (repr.) – New York, Knoedler & Co., 1966, n° 6 (repr.) – Kobe, City Museum, 1989, n° 30, p. 29 (repr.) – Paris, Ottawa, New York, 1988-1989, n° 268, repr. p. 442 - Zurich, Tübingen, 1994-1995, n° 168, repr. p. 276. Vernay, Les Arts, avril 1916, p. 28 (repr.) – Madsen, 1918, p. 32, n° 70 – Lafond, 1918-1919, II, p. 17 – Swane, 1920, repr. p. 73 – Hoppe, 1922, p. 30, repr. p. 31 – Venturi, 1939, II, p. 129-131 – Lemoisne, 1946-1949, III, n° 796, repr. 455 – Cabanne, 1957, n° 116 (repr.) – Boggs, 1962, p. 51, 112, pl. 113 – Breeskin, 1970, p. 13 (repr.) – Rewald, 1973, p. 516 (repr.) – Lassaigne, Minervino, 1974, n° 608, p. 114, repr. p. 115 – Hale, 1975, entre p. 120 et 121 – Broude, 1977, p. 102-103, 105, fig. 12 – Giese, 1978, p. 45, fig. 13, p. 49 – Dunlop, 1979, p. 168-169 – Connaissance des Arts, octobre 1980, p. 64 (repr.) – The Connoisseur, septembre 1981, p. 53 (repr.) – Thomson, 1985, p. 11-13, 16, fig. 7, p. 55 – Bade, 1992, p. 120, repr. p. 121 - Rome, Complesso del Vittoriano, 2004-2005, fig. 9, repr. p. 60.